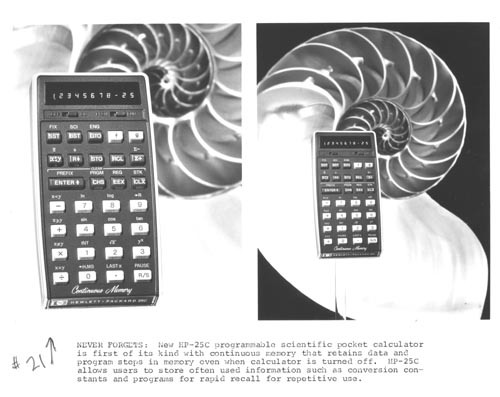 Two B&W images of the HP - 25C Programmable Scientific Pocket Calculator.The left image is larger than the right one. They are shown on a stand in front of a Nautilus shell. The display has "12345678-25. Recto bottom label: " NEVER FORGETS: New HP- 25C programmable scientific pocket coalculator is first of its kind with continuous memory that retains data and program steps in memory even when calculator is turned off. HP-2t5C allows users to store often used information such as conversion constants and programs for rapid recall for repetitive use." Recto bottom left "#21 with up pointing arrow"